This beautiful GEO THERMAL home rests on a 5+ acres. Fantastic ceiling to floor wall to wall view of the private pond, acres of property and Belle River Creek. Home has been well maintained and was constructed with every detail in mind. This home is neutral throughout. The kitchen has oak cabinets with hardwood floors. The wide open floor plan has so many windows that you think you are sitting outside. 1st floor master bedroom has a large master bath, jetted tub & closet. 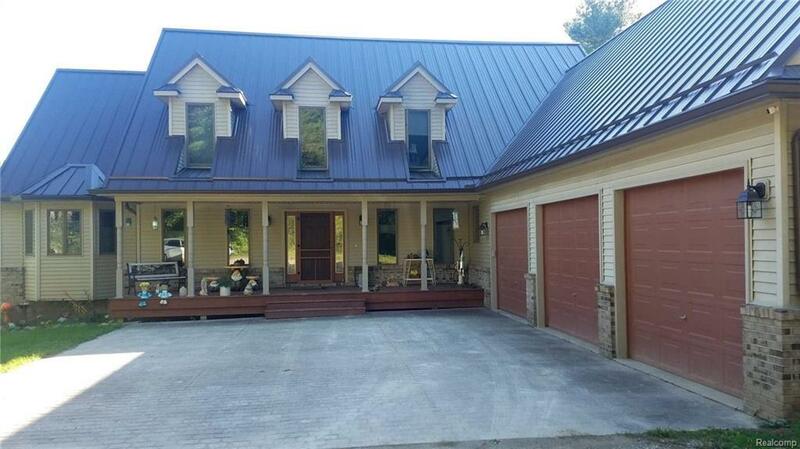 Brand new metal roof on home and pole barn. Gorgeous stamped concrete driveway and walkway are in front of the 3 plus car garage. The front covered porch and deck along the back of this home make you feel like you are on up north. Central vac, air conditioning, back up generator, fenced area for animals. Walkout basement with multiple windows providing natural light & is ready to finish with 8 ft ceilings. Brand new pole barn 11/2017. This is great place for entertaining or just escaping from the world.